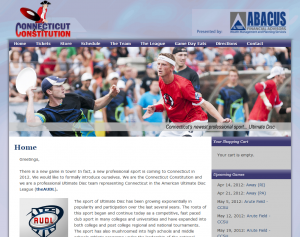 New Site Release – Connecticut is Ultimate! I’m very excited to be the “web guy” for Connecticut’s newest pro sports team! The Constitution, owned by local business guy Bryan Ricci, are part of the fledgeling AUDL – American Ultimate Disc League. Consisting of eight teams nationwide, the professional Ultimate league begins its first official season in 2012. Check out the site, and be sure to catch their first home game on May 5! Visit www.ctconstitution.com.